Earlier this week (and boy did I have to get up early for this one!) I presented at the Computers in Learning Research Group (CARLG) seminar at the Open University in Milton Keynes. My talk “open education: research and reality” was primarily aimed a a group of new PhD students who are all researching various aspects of open education. I used the invitation to take a reflective look at my own experiences of open education, my the evolution of my open practice and my relationship with research around open education. 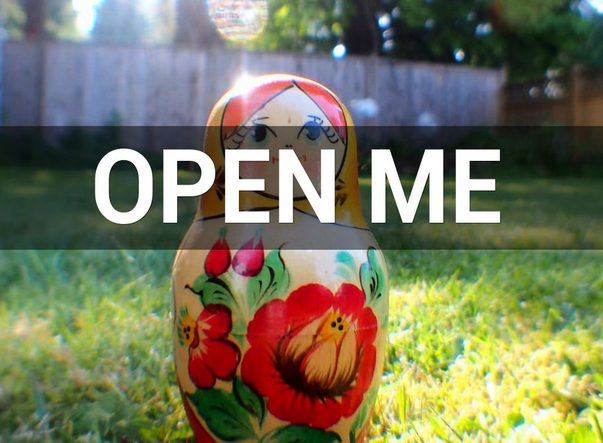 “Open Me” could well have been a more apt title for my talk, as I really used this phrase as a statement and as an invitation to explore the layers of my open practice. I used the Russian Doll metaphor to explain some the different layers and combinations of open-ness I experience. Much of my open-ness stems from my blogging activity, and I actively encouraged this group of new researchers to be as open in their research as early as possible. I think I may have succeeded. I always enjoy visiting the OU, but this visit was made even more special as I finally got to meet Helen Crump in person as she is one of the a-fore mentioned new PhD students. Helen and I met through open education (via the OLDS MOOC) and have had quite an open adventure together, not only studying together but being part of a collaborative writing team. I count Helen not only as a colleague but as a friend. A friendship that was created and is sustained via open education. You can view my presentation here, and there’s a recording on YouTube.